Winter is on the way, which means so is the cold weather. In many places, cold weather also brings snow. With even a few inches of snow, you may find yourself needing to clear off your sidewalk or driveway. You could use a shovel, but this is both exhausting and time-consuming. A snow blower will provide you with better efficiency, but you want to choose the one that best fits your situation. To help you with this, we’ve put together this Snow Joe SJ615E review. Before we get into the review, lets go over a few things to make sure this is the right snow blower for you. When purchasing a snow blower, it’s best to consider a few things before you make your purchase. There are a number of considerations you can make, but the most important ones are the size of your driveway and sidewalks, and how much snow you’ll be moving. When looking for the snow blower that’s right for your situation, you want to consider how much surface area you’re going to need to clear, and how far away from your house you’ll need to go. If you have a driveway that’s around 20 feet in length, you wont need something that’s designed to operate for multiple hours and at great distances. For this circumstance, an electric snow blower powered by a cable will work. However, if you have, for example, a 50-foot driveway, you’ll need a snow blower with much more operating time and range. For this situation, a battery powered electric snow blower or gas-powered snow blower is ideal. Another thing to consider is exactly how much snow you’ll need to move. You want to make sure that the snow blower you buy has a big enough auger and the necessary power to move the snow you need it to. For small amounts of snow at less than 10 inches in depth, a single-stage electric snow blower will get the job done at an affordable price. However, if you’re moving 10 inches or more of snow, or the snow you’re trying to move is rough, you may want to consider two or three-stage snow blowers. 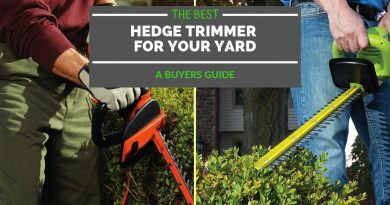 Now that you know a bit about what you should look for in a snow blower, you probably know what type of snow blower you need to purchase. If you’re looking for a snow blower that can easily clear smaller amounts of snow on a short driveway, the Snow Joe SJ615E might be just what you need. 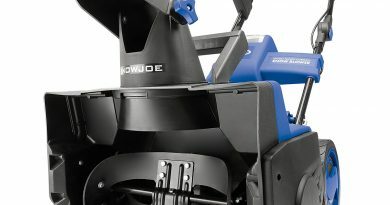 If you’re looking for a snow blower designed to pick up small amounts of snow on mid-sized driveways or sidewalks, this is what the Snow Joe SJ615E is best designed for. 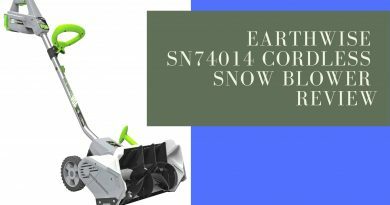 This corded snow blower comes equipped with an 11-amp motor that’s designed to move up to 440 pounds of snow per minute. Being electric, you can easily start up the machine with the push of a button, once plugged in. Additionally, the adjustable chute is built to rotate a full 180-degrees, and can throw snow up to 20 feet away from your work area. For most small jobs involving low levels of snow, this is plenty. To reach the snow throwing distance of 20 feet, make sure you feed enough snow into the machine. For small amounts of snow, you may be required to move a bit more quickly than you would with larger amounts of snow to maintain this throwing distance. 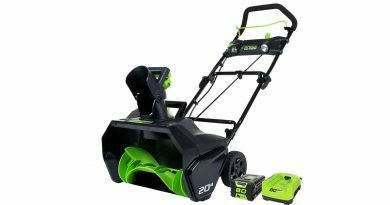 It’s relatively quick to get going with this machine, with the only downside being that you’ll need an extension cord to power it, meaning extra time will be required for getting it out and putting it away. 12 gauge for a 100-foot extension cord. 14 gauge for a 25-foot extension cord. 14 gauge for a 50-foot extension cord. The maximum recommended extension cord length is 100 feet, which can be a limiting factor for those of you with longer driveways or sidewalks that are too far from a power outlet. Best of all, the cord is located in a spot where it doesn’t get in the way of your work. 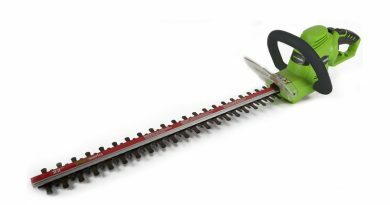 The 2-blade auger is built with cold-and-abrasion resistant plastic, and is 15 inches wide by 8 inches deep, making it perfectly sized for smaller amounts of snow. Finally, being electric, you won’t have to deal with oil changes, tune-ups, or other maintenance required by gas-powered machines. Being electric, you’d expect that the cord would get in the way of your work, but the cord is attached in a way that eliminates this from being a potential problem. With an extension cord, you get up to 100 feet of working distance, which is plenty for small to mid-sized driveways, walkways, and decks. You can rotate the chute 180-degrees, meaning you can easily throw the snow in whatever direction is convenient. The auger is well sized for work with small amounts of snow. You need to purchase the extension cord separately. 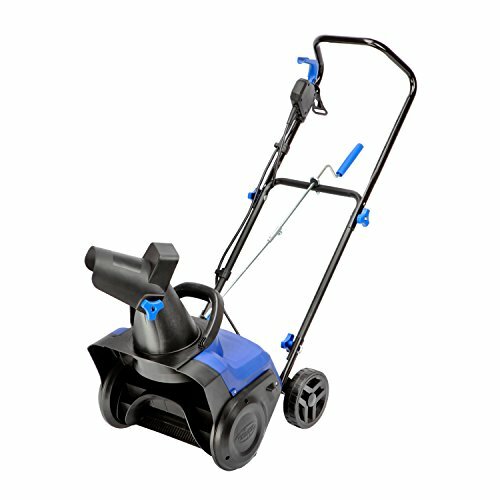 Make sure it meets the requirements for the Snow JoeSJ615E. The fact that the unit requires an extension cord rather than just having a longer cord attached to the unit means you’ll be spending more time than necessary getting started. 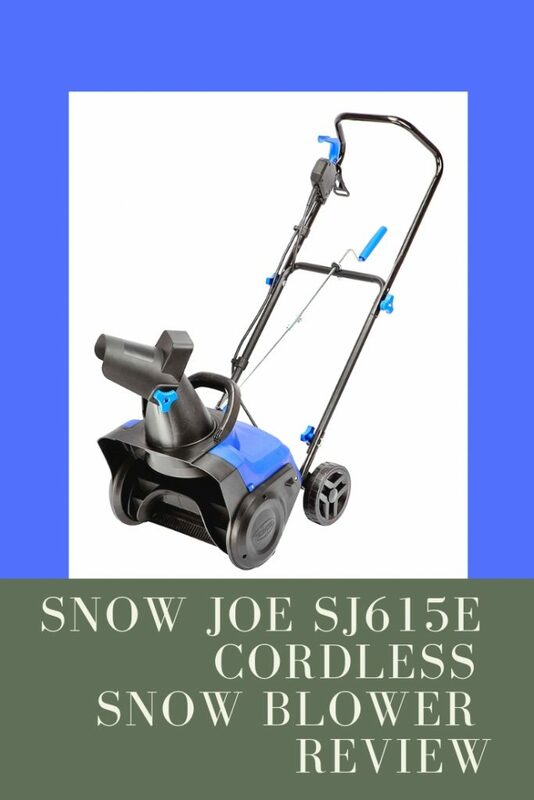 Minus the drawbacks of a separately purchased extension cord, the Snow Joe SJ615E is perfect for small jobs. The well-sized 15-inch wide, 8-inch deep auger housing combined with an 11-amp motor make it easy to get small to clear small to mid-sized driveways, sidewalks, and decks of small amounts of dry snow in a short amount of time. With 20 feet of throwing distance, snow gets thrown far enough away from the working area that it doesn’t creep its way back in. 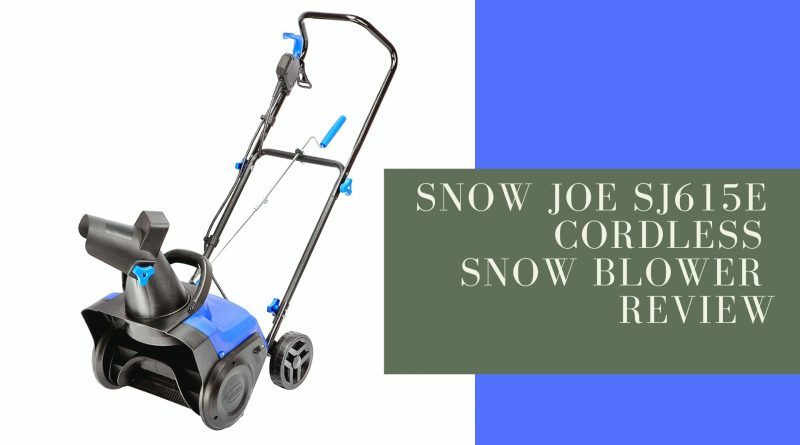 If you’re looking for something relatively inexpensive that can clear snow from small driveways and walkways with ease, the Snow Joe SJ615E is your best bet.